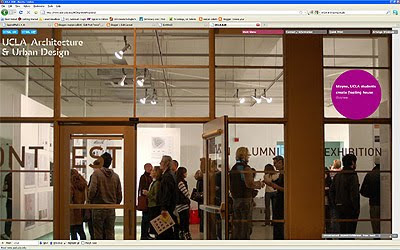 This Spring, Marjan (with M Cruz) will run a Design Studio at UCLA in Los Angeles starting January 4th, 2010. The studio starts with a conjoint workshop between Bartlett, UCL and UCLA students, 04.-12.01.10. Critics for the final crit include Kivi Sotamaa, Dina Krunic, Michael Osman, Hadrian Predock, and Georgina Huljich. The studio of marcosandmarjan is interested in crossing boundaries of the traditional architectural practice, developing innovative conditions in architecture. By looking into advances in a wide range of fields students are encouraged to develop a portfolio that reflects their individual research agenda. This includes digital poetics and fabrication, biotechnology (or better known as neoplasmatic design) and small-scaled intelligence, material engineering, environment, new architectural and urban typologies, sacred and sublime spaces. We believe in architecture as a system build up by many different strata, scientific knowledge, micro-worlds and objects. In a time where food is becoming an increasingly limited resource and thus a main concern in world politics, societies in the developed world are challenged to reconsider their modes of production and consumption in both small and large scales. It is not a coincidence that France and the UK are amongst a group of countries that have set Food security as their main target in terms of research and investment for many years to come, and others are now following. It is also part of our mainstream debate how our contemporary food chain in affecting on a biological and cultural level our diet and health. Further, there is an extraordinary repercussion of modern production/engineered food on the environment as a whole. As a result, architects are forced to rethink their design when it gets to some of our most basic needs: eating, cooking, storing, growing and harvesting. They are confronted with an extraordinary chain that has directly implications on the future design of our homes and cities. Following an inside-out approach, students will be asked to work on a particular aspect of domesticity (day-night-wet-dry...) and related environmental conditions (temperature control/waste/water...). In a second stage, the proposal will expand and focus on private/semi-private, with particular attention given to neo-ecological inter-/intrafaces. First iterations of ideas will be translated into components and prototypes. A first crit will follow. Meanwhile, contacts with other UCLA departments and LA companies, as well as international institutions such as TIS, Italy will be established. Students will work out their projects over the gap-weeks, and will get online tutorials. The next stage of the program will ask students to develop previous ideas into built components and prototypes (with an interdisciplinary approach - in collaboration with another department). Students will expand their projects into a larger scale, defining brief and context for a small scale building. Great consideration will be given to the conceptual/formal/contextual development of the initial ideas into a more complex architectural scenario (narratives/circulation/program/tectonics...). An Intermediate pinup will follow. This stage will require further developments of the public building and also progressive developments of digital models and fabrication techniques. Higher degree of resolution of the public building typology, with particular attention being given to the strategies of spatial/programmatic layout, but also to atmospherics and interiorities. Students will work out their projects over the gap-weeks, and will get online tutorials. An Intermediate pinup will follow. Parallel extrapolations of the architectural scale and interpolations of each individual project are proposed into an urban scale. Students will be asked to develop a self-sufficient, small-scale 'Agro-polis' – a new peripheral urban settlement or agricultural town to be chosen in California. The aim is for a final rendition of projects, and fabrication of conjoint model. Final crit and portfolio submission will end the term.